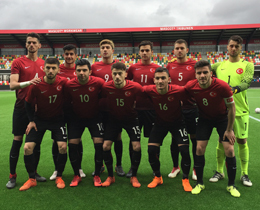 Turkish U19 National Team beat Austria 2-0 in the first match of group phase at 2017/2018 UEFA U19 European Championship Elite Round, Group 7. Turkey's Copenhagen Ambassador, Uğur Kenan İpek met with Turkish Football Federation's Football Development Director and Youth Teams Responsible Tolunay Kafkas before the match and wished luck to Turkish U19 National Team. After the match, Uğur Kenan İpek congratulated head coach Uğur İnceefe and the team for the result. In the other match of group 7, host Denmark beat Bosnia & Herzegovina 3-2.